Previous: What Type's Your Salary? "The bully beat me up again today," Josh sobbed, "even though it wasn't my fault." Rosh hugged him close and heard his story. It was quickly coming to a point when Josh was beginning to lose his desire to go to school at all. He didn't want to go to school authorities again, as he wasn't sure who to blame for these repeat incidences. He knew Josh was naughty too, but the repeat beatings were another matter altogether. "From next week, you are going to join Karate lessons," he said after Josh had finished speaking, "you will at least learn to defend yourself, if you can't learn to keep out of trouble in the first place." "Let me also tell you something very important about bullies. You can't reason with them. When I was a child your age I read an Aesopian story about a Wolf and a Lamb." “A hungry wolf was once drinking water at a stream. Looking up, he saw a little lamb drinking water further down from him. “Hey you,” he called out to the lamb, "How dare you dirty the water I am drinking?" "No Sir," gasped the surprised lambkin, "if the water is muddy up there, it cannot be because of anything I’ve done, as it runs downhill from you to me." 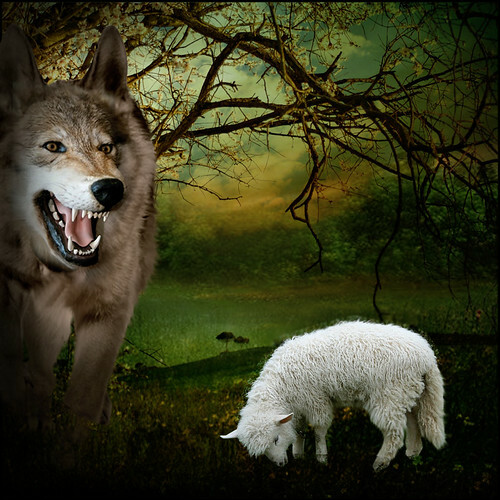 “We’ll have to investigate that,” warned the wolf as he walked down menacingly towards the little lamb. The lamb stood his ground knowing that he hadn’t done anything wrong and had spoken the truth. "I know you!" growled the wolf with sudden recognition, as he inched closer to the lamb, "you are the guy who swore at me this time last year." "Couldn’t have been me, Sir" refuted the lamb, "I am not even six months old yet." “Must have been your father then,” snapped the wolf, getting closer and angrier. The lamb sensed real danger now, and began to tremble. But it was too late to run. With that, he pounced on the lambkin and tore him apart. "Remember the Spanish saying, Lobo hambriento no tiene asiento. A hungry wolf doesn't hang about. So, try and stay away from one, as much as you can."